We are sold out of this series detailed below. To see if available elsewhere, click here, or search for other sellers on the secondary market. We thank you for your incredible support over the years!! This Inscriptions Series gives you the simple and straightforward complete set of ballplayer autographs like our Original Edition, but also adds the valuable and descriptive Inscriptions below each autograph, personally inscribed by each ballplayer.
. Each Work of Art in this Series is Licensed by MLB and the MLB Players Association & Certified Authentic via our “Triple Certification” method. 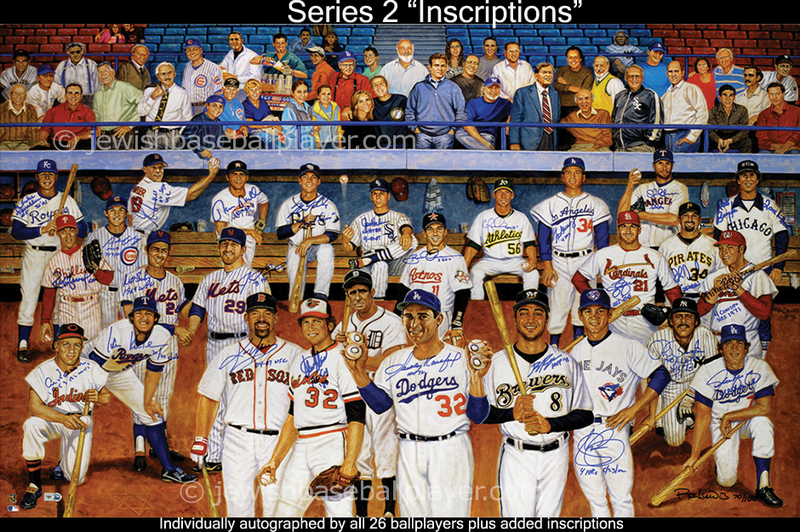 One 24” x 36” Work of Art individually numbered and autographed by every single ballplayer depicted on the field and the artist, with every player adding an individual inscription of their accomplishments, such as HOF ’72 for Sandy Koufax, 2011 MVP for Ryan Braun, etc. Personal phone call from one of the players in the Artwork welcoming you to the Jewish Baseball Player Executive Club, including yearly invite to Members/Ballplayers cocktail party.